52 Weeks #32: Some work around the office and what a bargain. One of the things that I like about my job is that I get to do a little bit of everything; it lets me be the “jack of all trades” that I so like to be. Recently the bathroom sink in our employee area fell off of the wall after being stuck to it for almost 30 years. It was decided to do a little bit of a redesign, since most people were not overly thrilled with the small sink we had anyway. I had some help in assembly from one of my new employees who is getting more interested in the wood working stuff. The building of the sink base of course was the easy part. Getting it installed with all of the plumbing connected took a bit of work. I have now installed all new plumbing on the sink. For those of you that have done plumbing or plan to do it. Please do not sweat connections to pipes inside of a cinder block wall with very little play. Just saying.. 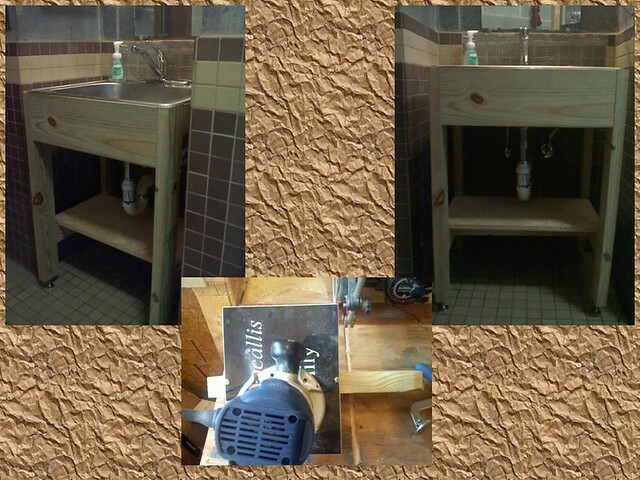 The sink base is made entirely of pressure treated wood as the way this bathroom is normally cleaned is with a hose. Several people asked me why we could not just buy a vanity; I kind of did not want to rebuild this again. Joinery was with pocket-hole screws. The bottom picture shows a quick jig I came up with to round over the legs; it was made out of an old plastic sign and a piece of 2×4. It worked quite well and I put it in out tool cabinet for future use. 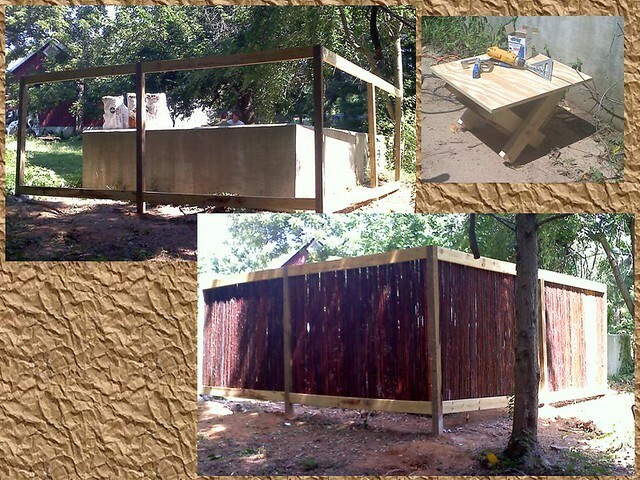 The other wood based project that we finally got a chance to get to this past week before my college help left is the first portion of a new fence that is to hide our work area from the public. My new guy took the lead on this one in getting the posts in the ground and we all worked on getting the framing up. To make things a little cleaner and faster we again used pocket-hole screws to attach the boards to the posts. The fence itself is bamboo. We will keep an eye on it over this winter to see how it does and have plans to add more in the future. The picture in the top corner shows another good use for my sawbuck. Besides this work last week I spent the weekend around the Pittsburgh area and attended the annual church festival and white elephant sale at my father-in-law’s church. I grabbed a bunch of miscellaneous wood pieces and a few small parts. The best find though was a microwave for $3, watch for more information about drying my own pen blanks in the microwave. Talk to you all soon. Have a good week in and out of the shop.